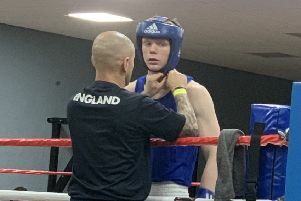 Luton fighter Jordan Reynolds was crowned the Senior Elite Home Counties 75kg champion after beating Hockwell ABC’s Linus Udofia in a tremendous bout at Canvey Island on Saturday. Reynolds had been deducted a point for low blows during the fight, while Udofia was given a debatable eight count while recovering. The pair had the venue on their feet, as Udofia, the underdog battled all the way, but Reynolds eventually took a unanimous points decision. Reynolds said: “I want to thank everyone from Luton for attending. Reynolds is now through to the Senior Elite Championships at the Echo Arena in Liverpool. Fellow Hockwell ABC boxer Klinton Baptiste is already Home Counties champion at 75-81kg and will now box in the pre quarter-finals held this weekend at the Army Combat Sports Centre in Aldershot.